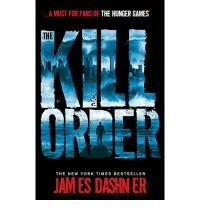 I never thought [b:The Kill Order|13089710|The Kill Order (Maze Runner, #0.5)|James Dashner|https://d.gr-assets.com/books/1330636153s/13089710.jpg|18261314] would be this much horrific. I almost scared. [a:James Dashner|348878|James Dashner|https://d.gr-assets.com/authors/1204922790p2/348878.jpg] made a dystopian future more scary. Don't read this book before completing the Maze Runner Series.